Spiti Valley in 13 Days – How to Plan your Itinerary ? Spiti Valley is a name that will never get old on you. No matter how many times you come here, you will never get enough of it. When I get asked about what I think of Spiti valley, my answer always is that it is an enchantment; the one that will keep you mesmerized for long. The journey from the lush green of Shimla; to the barren brown of Spiti; to the blue of the lakes and then back to the greens of Manali will leave you with an experience of a trip of a lifetime. Thousands of people travel here each year and they all cherish the memories for months and years to come. If you too were planning a trip to Spiti; had about 2 weeks in hand; then in this article, I will provide details on how you can visit Spiti valley in 13 days. Your final travel plan will of course depend on several details like how you are traveling; where are you coming from; is there any budget limitation etc; but the details below should at least get you started on laying down your own itinerary. If you need my inputs or have any question, you may ask in the comments sections towards the bottom of this page. The first question that comes to mind while planning a trip is on when to go. A lot of people think that like Ladakh, Spiti valley too remains off limits during winter; and you cannot reach here by road which is not really true. There are two ways to reach Spiti valley. One is from Shimla and the other route goes via Manali. From Shimla side, the road remains open throughout the year all the way till Kaza. So yes, you can actually plan a trip to Spiti valley even in peak winters. When should you go will really depend on what do you want to see there. If a snow-covered white Spiti is on your mind then February will be the best time. If you want to see lush green hills all around then late August or early September is the time to go. For the adventurous type, going in monsoon season will be great fun. If you want an event-less trip and a little bit of snow around, traveling in May or early June will do you good. After when comes the how part. Of the two roads to Spiti , the one via Shimla is the longer one. Depending on your itinerary and places covered, a journey from Shimla to Kaza can be well over 500 kilometers; and will take you at least 2 days. This however is also the easier of the two roads and remains open throughout the year. There could be occasional roadblocks caused by extreme weather; like if it rained too heavy or snowed too much. But even in that case, authorities get to work immediately and clear the road just as soon as they are able to. Reason behind this is that there is no high altitude pass between Shimla and Kaza. On the other hand, the road from Manali to Spiti is only 200 kilometers long and you can do this journey in about 9 to 10 hours. But this one day long journey will take you across two high altitude passes; Kunzum Pass and Rohtang La; both of which are notorious for receiving high amounts of snow each year. Due to this, this road remains blocked for most part of the year and is only open from June till early October. So keeping the above mentioned in mind, I will suggest three different type of itineraries. The first set will have you traveling on the entire circuit, starting from Shimla and ending at Manali. This travel plan can only be followed between June till September. The second itinerary will both start and end at Shimla and can be followed throughout the year; irrespective of your time of travel. The third itinerary will have you start the journey from Manali and then circle back to Manali only. This will be ideal for people who only want to cover Spiti valley and not Kinnaur side of the circuit. For the sake of this article, I will assume that you are starting the journey from Delhi. If you were coming from a different city, then the details for first and last day will be different. Rest of the itinerary can still be followed. A detailed explanation of this itinerary is as mentioned below. For a list of all tourist attractions in these towns; or the tourist places that you should visit; please read Tourist Attractions in Spiti Valley and along the Circuit. Below is a day by day breakdown of this itinerary. There is not much to write about this day really except for that this will be a long and monotonous drive. Shimla is a bit too crowded for my taste so I always prefer to stretch the journey by another 2 hours and make it all the way till Narkanda. Total distance covered would be close to 400 kilometers in about 9 to 10 hours. Road conditions will mostly be OK except for some bad stretches between Chandigarh and Shimla. If you reached well in time then you can also visit Hatu Peak at Narkanda before sundown. There are good amount of hotels at Narkanda and you will easily find a place to stay. Your second day of the journey will bring you to the quiet little town of Sarahan. There is not much of traveling involved for this day; just about 100 kilometers that you can easily cover in 3 – 4 hours at most. As a matter of fact, from here on, you will not be spending much time on the road on any of the days; except for the last one when you drive back home. So you can actually completely focus on sightseeing and exploring the places. First thing to do on this day is to drive to nearby Hatu Peak if you did not do so yesterday. It will take you about an hour at least for the short trip. Have breakfast at Narkanda, check out of your hotel and start on your way towards Rampur. From Narkanda, the journey is mostly all downhill till the banks of Sutlej River. You will reach Jeori from where you will have to take a diversion. At the main chowk of Jeori, you will notice a steep narrow road climbing up towards your right. Turn on this road, drive about 16 kilometers and you will reach Sarahan. You should be able to reach Sarahan by noon easily. Check into a hotel, have some lunch and then you can visit the famous Bhimakali temple in the evening. There is also a bird sanctuary in Sarahan that you can visit if it was open at your time of arrival. Destination for today will be the beautiful Sangla valley and you will be staying for the night at the small town of Sangla. From Sarahan, you will have to drive back down to Jeori. That’s right, there is no direct road from Sarahan to Sangla and you must drive 16 kilometers down to Jeori; back to the spot where you took the right turn yesterday. From Jeori, drive to Karcham and when you are at the dam, leave the main highway and cross the bridge to the other side. Sangla and Chitkul too are not on the main highway and you will have to drive about 40 kilometers in another direction. Total distance from Sarahan to Sangla will be 90 kilometers and travel time will be about 3 to 4 hours. Roads from here on will be a mix of good, bad and ugly. There are several hotels at Sangla and you will have no problem finding a place to stay. At Sangla, you can visit the local Kamru fort. There are a few ways that you can spend this day. Chitkul is merely about 25 kilometers from Sangla. So you can either start in the morning, drive to Chitkul and return to Sangla for the night. Or you can just drive to Chitkul and stay at any of the hotels there. At Chitkul, you can either just spend the day relaxing; or you can go on a shot 4 to 5 hours trek to Rani Kanda. Talk to any of the locals around and you will easily find a guide to take you out on this trek. We are talking about the trek here that goes from Chitkul to Gangotri via Rani Kanda, Dumti and Lamkhaga Pass. You will only however trek till Rani Kanda which is about 9 to 10 kilometers away from Chitkul. It is completely your choice. You can either just relax and enjoy the beauty around you because you have sufficient time for Spiti trip. Or you can be a bit adventurous and head out to explore more. Also read: How to Prepare your motorcycle for Spiti Trip? From Chitkul, we will be heading towards Kalpa which is about 65 kilometers from here. Travel time will not be any more than 3-4 hours at most so you have plenty of time before you start on your way. You will have to drive back all the way till Karcham while crossing Sangla on the way. Once you reach Karcham, cross the dam once again and start driving towards Reckong Peo. The towns of Reckong Peo and Kalpa as well do not fall along the main highway so you will again have to take a diversion. You will first reach the small town of Powari. There is a petrol pump here where you may want to tank up. A few kilometers after the petrol pump, you will notice a road climbing up to your left. Turn on this and continue driving uphill for about 10 kilometers to reach Kalpa. You will first reach Reckong Peo and may want to ask around for directions if you got confused about which road to take in Peo. Once you reach Kalpa, just continue driving uphill. You will come across a few narrow roads, hardly wide enough for one car with houses on both sides. Do not stop anywhere and keep going up. Cross Kalpa town completely and that is when you will start noticing hotels. For reference, ask anyone where HPTDC Hotel Kinner Kailash is. There are a lot of hotels on the road where this hotel is. You can stay at Kinner Kailash as well if it fits your budget; or just ask around at other hotels. As you take the turn from Powari and start climbing up towards Kalpa, be ready for spellbinding view of the imposing peaks of Kinner Kailash. You will love it. The journey for this day as well will be not too long but will be on some really bad roads. You will travel slightly over a 100 kilometers but because of the road conditions, it can very well take you up to 5 hours. I have been to Spiti multiple times and on this particular section of the road, there is always restoration work going on; that is how bad it gets here. This area is mostly all “shooting stones” region so if you were on motorcycles, be careful about where you stop. Even a small stone falling from the hill above could kill you if it hit your head. From Kalpa, drive down again to the main highway via Reckong Peo. Last petrol pump as I mentioned is at Peo and after this, the next one is at Kaza so don’t forget to tank up if you did not the previous day. From Peo, continue towards Khab and then climb up to Nako via Ka. Hotels in Nako as well these days are in ample amount so you will have no problem finding a place to stay. Also read: How to Prepare your Car for Spiti Trip? For this day, you can chose to stay at either Tabo or Dhankar. Both of the places have hotels to stay but Tabo is a little better in terms of options. Staying at Dhankar however will give the opportunity that you can use this day to trek to Dhankar lake; which takes about an hour to two. If you stayed at Tabo then you also have the choice of staying at the Monastery there. It is completely your choice and both of the places are equally good. Tabo is about 63 kilometers from Nako and Dhankar is about 90. Roads will be mostly average and travel time will not be any more than 3 hours. If you stayed at Dhankar on the previous day then today you can head straight to Mudh Village in Pin Valley. If however you stayed at Tabo; then another thing you can do is to start early from there and reach Dhankar Monastery. Spend some time at the monastery, leave your vehicle there and trek to Dhankar Lake. Be back in an hour and then be on your way towards Mudh Village. In order to reach Mudh Village, you will have to reach Attargo bridge which is about 16 kilometers before Kaza. It is a huge bridge and there is a board marking it as an entrance to Pin Valley; so you will have no trouble spotting it. Cross the bridge and drive through the beautiful Pin Valley for 35 kilometers to Mudh Village. At Mudh, you can either stay at Tara Guest House or Ibex Guest House. If both of these were full then there are several other hotels there where you may stay. For more details on the road that goes to Pin Valley and you can travel on it, please read How to Plan a Trip to Pin Valley? Destination for today will be Kaza, headquarters of Spiti Valley. Distance traveled will be just about 50 kilometers so you are in no rush to start early. From Mudh, drive back to Attargo Bridge, turn left and then continue 16 kilometers to Kaza. Goes without saying, there is no shortage of hotels in Kaza and no matter what your budget is, you will easily find a place to stay. I will recommend staying at Hotel Spiti Valley, right opposite Kaza Monastery. It is on the main road itself so you won’t even have to enter the narrow streets of Kaza. Contact person is Tanzin and his number is 9418927312. Give my reference and he will take good care of you at discounted rates. While you are in Kaza town, do not forget to visit the beautiful Kaza Monastery. If you were staying at Hotel Spiti Valley, then the monastery will be right in front of the hotel, on the other side of the road. You should also take a walk at the local Kaza market at evening. Next destination in the itinerary is the famous Chandratal Lake which is also the star attraction of this entire journey. Spending a night here at the camps is must for everyone. In my opinion, a journey to Spiti valley is incomplete if Chandratal is not a part of it. With that being said, after Kaza, you will truly understand the definition of the term “bad roads”. The entire stretch until Manali is a joy ride; but the 14 kilometers long road to Chandratal will have your heart jumping to your mouth if you were in a car. This entire stretch is extremely bad and is barely wide enough for a car. After Kaza, you will take the road towards Losar and then climb up to Kunzum Pass. After crossing the top, as you climb down and about 2 kilometers before Batal, you will notice a narrow road towards your right. This is the road you need to take to reach Chandratal. There is also a board there marking this road. Your fun on bad roads will continue today as well. The road from Chandratal to Manali, and a particular Batal – Gramphoo stretch on it, is notorious for being annoyingly bad. This stretch is barely 60 kilometers long but will have you cross so many water streams that you may as well write a book called “My experiments with Water Crossings”. From Chandratal, drive back 14 kilometers till you reach on the Kunzum – Batal road. From here, drive down 2 kilometers till Batal where you can take a break at the Dhaba here. After Batal, drive slowly and carefully till Gramphoo. You will then exit at Manali Leh highway from where you will take left to climb up Rohtang Pass. At Rohtang, you will be stunned by the scenic beauty of this majestic pass; and surprised by the amount of tourists and traffic here. Spend some time at the pass if you wish to and then start driving down towards Manali while getting irritated by the famous “Rohtang Traffic” The entire journey from Chandratal to Manali will easily take you about 8 to 9 hours due to bad roads and then the traffic between Manali and Rohtang. Not much to write about really except for that this will be the most boring days of all. Your awesome trip is ending today and you also will have to drive a long 550 kilometers back home; which will take about 14 – 15 hours depending upon your speed and breaks. And that will be the itinerary you can follow for a 13 days trip through Spiti valley. Your travel time on first and last day will be bit much but on rest of the days, it is mostly 4-5 hours and thus allowing you sufficient time for sightseeing. If you have an alternate plan in your mind and want my advice on it then you may ask in the comments section below. Also read: What Clothes to Pack for Spiti Trip? The above itinerary can only be followed when Manali route is open. If however, you were traveling at a time when it wasn’t, then you will have to circle back to Shimla and skip Manali altogether. In that case, the itinerary can be as mentioned below. The same way, if you were planning to visit only from Manali side and skip Shimla route altogether, then your itinerary can be as mentioned below. Now since we are talking about traveling to Spiti valley from Manali side; then I think I should also add a bit of information on the permits needed for Rohtang and Spiti valley. If you are an Indian national, then you do not need a permit for visiting Spiti valley. You are free to travel any way that you need but must carry a valid government issued identity card; like Aadhar card or Driving license etc. There are check posts in between where you will have to register yourself and produce the identity card. If however you were a foreign tourist, then an Inner line permit will be needed for you to travel to Spiti valley. This permit can either be obtained from Shimla, Manali, Reckong Peo, Keylong or even at Kaza. For more details on this permit, procedure and related charges, please read How to Obtain an Inner Line Permit for Spiti Valley. 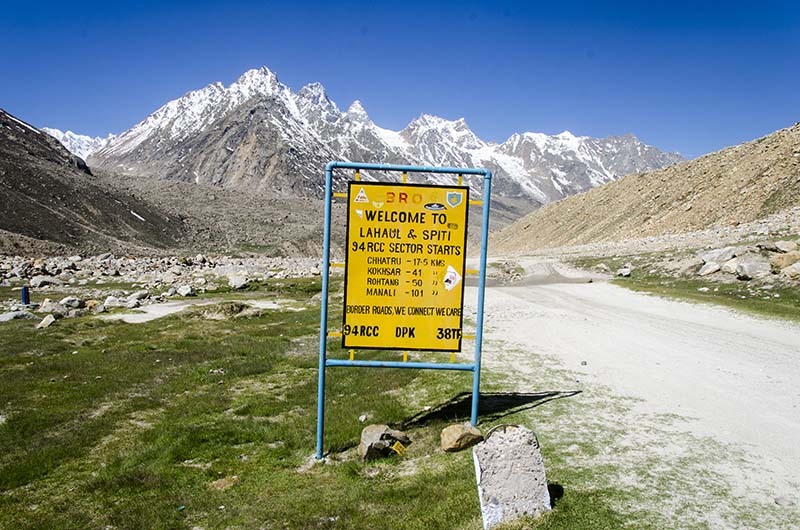 No matter whether you are an Indian or a foreigner, for going to Spiti from Manali side, you will have to get a permit for crossing over Rohtang Pass. This permit can either be applied for online or obtained in person from DM office Manali. Without this permit, no one will be allowed to travel to or cross Rohtang Pass. For more details on this permit, procedure and related charges, please read How to get a Permit for Rohtang Pass. Another thing that you should keep in mind and pay close attention to is acute mountain sickness. If you went from Shimla and traveled to Manali in 14 days; then chances of you suffering from altitude sickness anywhere in the trip are really next to none. It however becomes a concern if you went from Manali to Kaza. Think about this, one day you are in the plains at your in the morning. By evening, you reach Manali at 2,000 meters. Then next day, you travel to double the amount of this altitude; to Kaza which is close to 4,000 meters. This jump in altitude is way too sudden for our bodies to handle; which will make you prone to suffering from mountain sickness. For most people, it usually lasts just a day and they are OK by next. Once you reach Kaza, have plenty of rest and do not exhaust yourself. Do not go to Chandratal from Manali and cover it while on your way back. If however you are not OK in a couple of days and your condition worsens, please immediately seek medical attention in Kaza. If you were not traveling to Spiti by your own vehicle and were going to rely on public transport; even then you can follow the itineraries mentioned above. All the places mentioned are very well connected by regular bus service or shared taxis. For more details on how you can plan this journey by public transport; the bus schedules and timings, shared taxis etc, please read How to Travel to Spiti by Public Transport. At this article, I have explained the same itineraries but while relying on buses and shared taxis. Another article I will recommend reading is Bus Service in Spiti Valley – Timings and Schedules. I hope the information above on visiting Spiti Valley in 13 days was of help. If you have any other questions, or need any further details, please feel free to ask in the comments section below; or at our Community Forum; and I will be glad to answer.